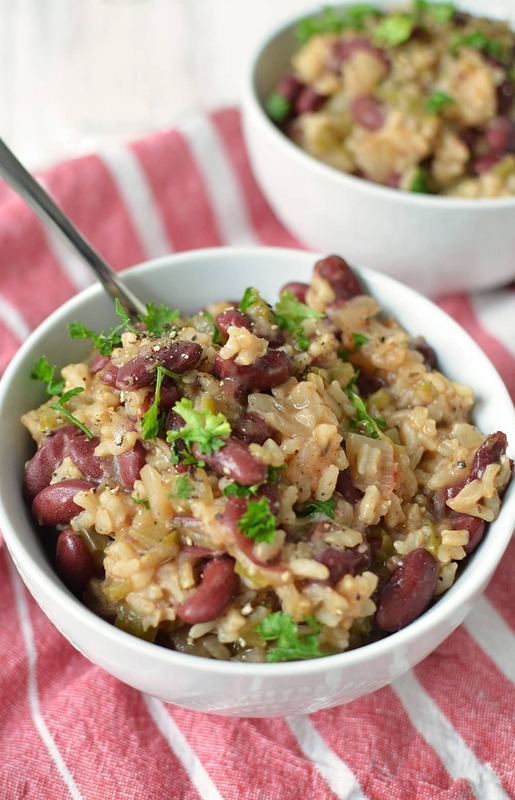 Place the red beans, onion, green pepper, celery, thyme, garlic, vegetable broth, bay leaf, smoked paprika and cayenne pepper in a slow cooker and cook on low for 4-5 hours. Stir in the rice, pinch of salt and pepper, and increase heat to high and cook for 1-2 hours depending on the rice you use (see notes) . Depending on the type of rice you use, it should cook in 1-2 hours on high. I used a sprouted blonde rice and it cooked in 40 minutes. Brown rice should take roughly 2 hours. If you decide that you don't want to add the rice into the slow cooker, reduce the liquid to 1 cup and cook rice on it's own.